Madison can win first district title since 2012 with win over defending champ Johnson. Notable: Madison can win its first district championship since 2012 with a victory . . . Johnson would force a three-way tie with Madison and Reagan (8-2, 6-1) in the final 27-6A standings with a win. Johnson must beat Madison by 14 points to win the district title . . . The Jaguars capped their 10th season last year with their first football district championship . . . Ron Rittimann has been Johnson's head coach since the North East ISD school opened in 2008. He has a 68-52 career record, all compiled at Johnson . . . Rittimann was an assistant coach under Jim Streety at Madison from 1991 until he landed his first head-coaching job at Johnson in December 2007 . . . A 1989 Madison graduate, Mavs coach Blaine Pederson returned to his alma mater as an assistant coach in 1995. Pederson remained on Streety's staff until he went to Johnson in 2008. Pederson was the Jaguars' defensive coordinator for nine season before he returned to Madison as head coach in 2017. 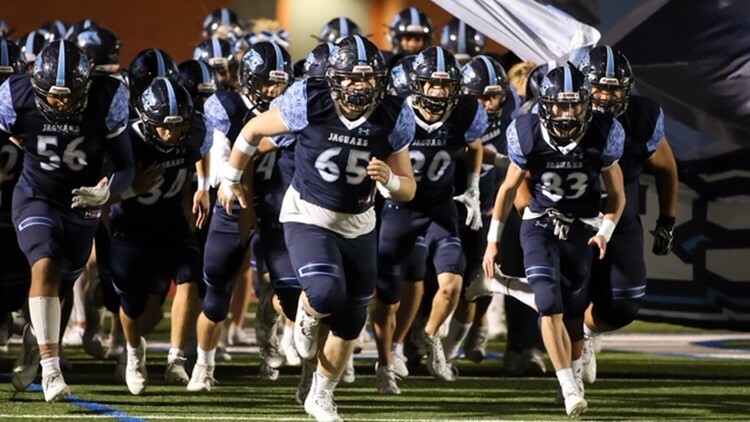 SAN ANTONIO – There will be a slew of storylines when Johnson and Madison clash for the District 27-6A football title Friday night, but none will be more compelling than Madison having an opportunity to dethrone the defending champion Jaguars. A victory against Johnson would be the high point – at least for now – in a turnaround season for the Mavericks, who won only eight games the previous two seasons and haven’t been district champions since 2012. Madison fell on hard times after local high school coaching icon Jim Streety retired following the 2013 season. The Mavs went 12-30, including 0-10 in 2015, in four seasons under three different coaches. But Madison, No. 3 in the KENS5.com Class 6A area rankings, has returned to prominence in its second year under coach Blaine Pederson. The Mavs, 7-2 overall and 6-0 in 27-6A play, head into their showdown with Johnson (7-2, 5-1) riding a seven-game winning streak that started with a nondistrict victory against perennial power Smithson Valley. The North East ISD rivals square off in the San Antonio area’s marquee matchup at 7:30 Friday at Comalander Stadium. Both teams already have clinched spots in next week’s opening round of the state playoffs. “We’re excited about this opportunity against Johnson,” Madison coach Blaine Pederson said this week. “The guys have been getting better every single week. Our deal is we want to keep winning games. We want to win the district championship. We want to get in the playoffs and win games. No. 7 Johnson has won five straight since losing its district opener to Reagan, which routed South San 38-0 in its regular-season finale Thursday night. Reagan (8-2, 6-1) is No. 4 in the KENS5.com rankings. “We’ve gotten better each week,” Rittimann said. “What I’m excited about Friday is that we still a full, four-quarter game in all three phases of the game against a really good team. We’ll have that opportunity against Madison. If you want to make any noise in the playoffs, you have to be battle tested. Madison wins the title outright with a win over Johnson, of course, but the Mavs still could take the crown if the Jaguars don’t beat them by at least 14 points. A Johnson victory Friday would create a three-way deadlock with Madison and Reagan for first in the final 27-6A standings. In that scenario, positive points would determine the district championship. In an era when four teams from each district advance to the playoffs, district titles still are important to the kids who play the game, Rittimann and Pederson said. “There are three things you want to win every year,” Rittimann, 51, said. “You want to win a district championship. You want to win a regional championship and you want to win a state championship. Those things are important to your culture, important to the way your community views things. Pederson and Rittimann coached together at both schools and have been good friends for more than 25 years. Pederson, 47, graduated from Madison in 1989 and joined Streety’s staff in 1995. Rittimann already was at Madison, having been hired by Streety in 1991 when he became the Mavs’ head coach. Rittimann and Pederson coached together at Madison for 13 seasons before Rittimann was named Johnson’s first head coach in December 2007. Pederson went to Johnson in 2008 and was the Jaguars’ defensive coordinator until he become head coach at Madison in 2017. Four Johnson assistant coaches – offensive coordinator Jimmy Cueva, Keith Randle, Bruce Gillespie and Gordon Gesell – and athletic trainer Tim Moore also worked at Madison before going to Johnson, the newest high school in the North East ISD. “We go way back,” Rittimann said. Streety, now athletic director of the New Braunfels ISD, said that he would have been at Friday night’s Madison-Johnson game if New Braunfels weren’t playing at the same time. Rittimann and Pederson talked about the profound influence Streety has had on their lives and careers. “When I got into coaching with him, I was a young man,” Pederson said. “He was a great person to work for. The best thing about him is that he always let his coaches coach. I just cherish those moments where he was running things and we just learned so much from him. "Probably the biggest thing about him is he’s probably the most organized guy I know. He was always prepared for anything. That’s part of what I learned from him, being organized and thinking ahead and anticipating things to happen. Rittimann was well prepared for his first head-coaching job after coaching with Streety for 17 seasons at Madison.